Wisdom teeth are technically known as 3rd molars. 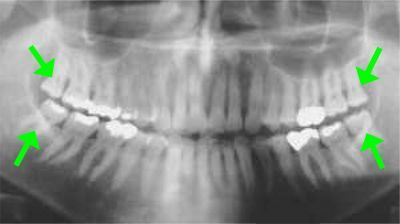 Teeth erupt appear in sets of four (upper right, upper left, lower right, lower left); however, not everyone has wisdom teeth, and even if they are present, the number of wisdom teeth can vary. You may have four wisdom teeth or less or none or rarely more than four. Wisdom teeth are not required for normal function, have short roots, are tipped forward and cannot adequately support bridges or partials for long. Unfortunately, the wisdom teeth are now usually trying to erupt into a jaw that is too small. Wisdom teeth are considered vestigial organs (a vestige is a degenerative or imperfectly formed organ or structure having little or no utility, but in the earlier stage of development of a species performed a useful function). Wisdom teeth symptoms can include pain at the back of the mouth, behind the molars. This pain will gradually increase with time as the wisdom teeth continue to grow in misaligned or sideways, pressing on nerves and bone, and crowding surrounding teeth. Other wisdom teeth symptoms include pain, redness, tenderness and/or swelling around the site. As wisdom teeth begin to erupt through the surface of the gums, this allows bacteria to enter through open tissue, which can result in infection. Oral infections have been shown to affect your overall health as well. It’s also possible for wisdom teeth to become impacted, a state in which the jaw bone or neighboring teeth block the teeth from erupting. They become trapped in place as their roots continue to elongate, and the longer they remain impacted, the more likely they are to cause problems for your oral and general health. Wisdom teeth symptoms due to impaction include severe pain at the back of the mouth, infection, and other complications. Foul breath, bad taste upon chewing food, redness and swelling can all be signs of infection. If left untreated, impacted wisdom teeth can breed cysts and, in rare cases, tumors. Wisdom teeth and wisdom teeth removal do not always have to coincide. Just because you have third molars coming in doesn’t automatically mean they have to come out. If you have two or even all four coming in, you may have room for them. Before you allow a dentist to schedule you for having them removed, be sure that they actually need to come out. In most instances, a dentist will only recommend extraction if they are growing in at an awkward angle or if they are going to cause overcrowding. You are always allowed to ask to see the x-rays if you question what is taking place within your mouth. It’s important to look at the cost of wisdom teeth removal. It may not be a simple extraction, which means the costs may be considerably higher. Any time that you have impacted teeth, it may require anesthesia. This will add to the costs and dental insurance may not cover everything. This is why it’s important to find out what the costs are up front and find out how much insurance will cover. You are within your right to contact a few dental offices and find out what the costs are for wisdom teeth removal to ensure you are getting the best prices possible. By taking the time to review costs, you can save some money on the procedure. Surgery may be required for removing the wisdom teeth because of how impacted they are. The moment you find that wisdom teeth are being problematic, you need to make an appointment with the dentist. If you wait longer, you run the risk of needing surgery because the problem is only going to get worse with time. Not all doctors will do their own surgery, many will send you to an oral surgeon, which means you have someone you have never met before performing the surgery.